I hope this is an acceptable way to distribute this info. 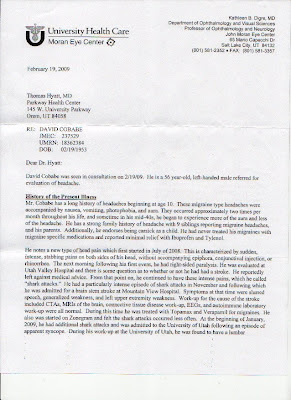 I decided to simply publish the letter here; if the doctor objects for some reason, I can always take it down. If you cannot read the text as you browser is rendering it, try double click to view the image. It is larger than it looks, but I scanned it as an image, so the text looks smaller. Thanks for sharing this information, Jim. It seems that Dr. Digre was very exacting. I hope her recommendations continue to help you. Have the shark attacks decreased? I am anxious for you to feel better! It is too soon to make a good judgment. But I have had no more intense shark attacks in a long time, and I have experienced very many quite diminished in intensity. I mean two or three orders or magnitude, so I note their passage, but just. It is a blessed relief. 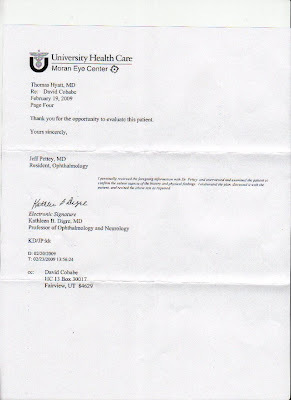 I am going to add to medical history for the sake of completeness tnat I have also experience in my adult life BEB and Bell's Palsy incidents, the BEB cinplaint more than one time, I was frightened by these bizarre BEB episodes, but never sought medical help since they were always accompanied by other migraine weirdness at the same time. I think that should read "blind" instead of "bind". Harder to type when you are trying to peek around the edge of this big gray beach ball that is somehow always in front. I had to look up lots of stuff, and I still do not understand it all. Can you share a bit of you light and knowledge please? One of the issues I am troubled by is new neurological deficits that are either not mentioned or much worse than that initially evaluated. 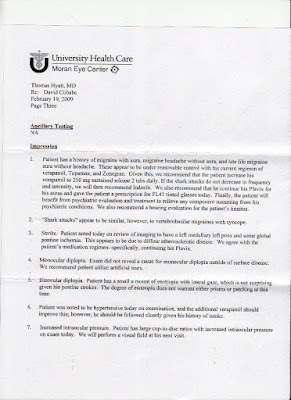 I believe I had another slight stroke or TIA since the last brain scan MRI in early January, but I have such a dread aversion to hospitals, I refused to submit to another hopital episode at the time. I am having a lumbar spine MRI in a couple of weeks to follow up on the neurosurgery. Am I just acting like a paranoid hypochondriac, or should I request that they just do a brain scan while they have me in the tunnel anyway? Yes, you are acting like a paranoid hypochondriac but that is a perfectly normal way to be in this age of health care. Yes get the brain scan but don't wait until your appointment to schedule it, get it ordered ahead of time to go with otherwise the pillars of medical care may crumble. My efforts to avoid looking like a paranoid hypochondriac got me a case of pnemonia. 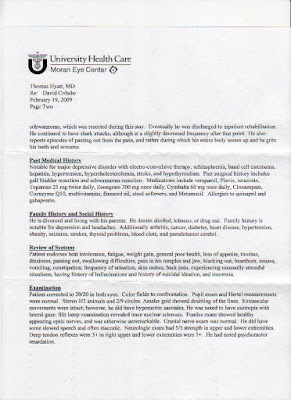 I'll have to go over the letter again to pick out details and figure out the parts I don't understand but the bottom line seems to say, these are the symptoms, we don't know quite why this is all happening or if everything is related or not or if these are all separtate issues but this is what seems to be working the best. This is not a criticism, I would rather have a good doctor that takes their best guess than one who knows for damn sure what's going one. Didn't know you had migraines for so long. I did too but didn't know what to call them until they got bad enough to affect my daily functioning. Nobody believed the severity (I'm the hypochondriac in my family) until my sister Laura started having them too. Mine are typical and are very well controlled at this point. Don't ask me. I'm just the only one in your constellation who understands neurology on a highly comprehensive level. I meant a general offering and solicitation to all. How can you possibly misconstrue an internet blog invitation as being exclusive? Obviously, there is some thinking here that is far too complex for me. Please be kind and explain. Remember I am weak-minded, and speak softly and gently.